What's this?! Recipes for tasty items with no regard to calories and fat?! Well that's the neatest part - if you eat delicious, healthy, plant-based foods in appropriate portions, you don't have to worry about all of that! That's right, you can eat real peanut butter! Just choose the kind that isn't loaded with sugar, stick to just a couple of tablespoons, and you can eat something yummy, and you're guilt-free! Right-click on any recipe to download or print it, then eat all happy-like and find yourself powered by Stuff That Rocks! 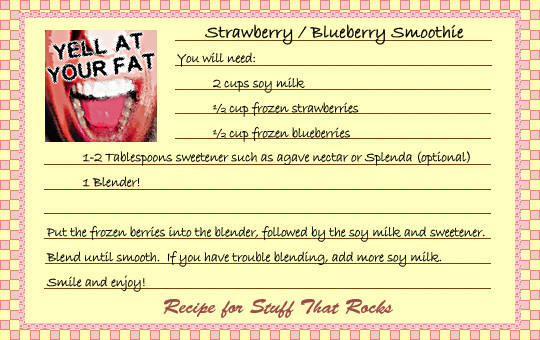 Put the frozen berries into the blender, followed by the soy milk and sweetener. Blend until smooth. If you have trouble blending, add more soy milk. Smile and enjoy! Put the frozen soy milk in the blender, followed by the liquid soy milk, peanut butter, and sweetener. Blend until smooth. You may need to stop periodically and move the frozen soy milk around with a spoon so that it will blend easier. If you have trouble blending, add more soy milk. Smile and enjoy!